“I have been on a PAT test course before but this one was by far more enjoyable and easier to grasp. Good theory and practical balance. Most of our PAT training is carried out at the customers site, please look at our On site PAT testing training page or contact us for details. All delegates receive a £40 discount off the microPAT Package. The most common question we are asked is ‘Can I do my own portable appliance testing’? The answer is ‘YES!’ Given the relevant training and using the correct equipment, and that’s where Quick Test comes in. 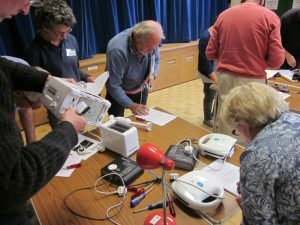 You do not need any prior knowledge of PAT testing or electricity to attend our PAT Training course. The Quick Test PAT testing training courses take just half a day and cover the procedures and practices to enable anyone to undertake their own PAT testing. The course includes both practical and theory sessions where we will monitor your progress. Two trainers will be on hand throughout to help and answer any questions. All delegates are given time to practice at their own pace. On successful completion of the course each delegate will receive a Certificate of Competence in PAT Testing. All delegates keep the comprehensive illustrated training manual. Ongoing telephone and email support is available to all delegates. We cover the following topics in our PAT testing training. WHAT Do We PAT Test? To arrange a PAT testing training course at your premises telephone 01904 790017 or email us. What some of our delegates have said . . . The Practical Guide to In-House PAT testing book priced at just £20 provides information for undertaking In-House inspection and PAT testing. This is a comprehensive illustrated guide ideal for those who don’t feel the need for a trainer to show them how to use a PAT testing machine but would like guidance on carrying out a PAT testing regime. To purchase a Practical Guide please telephone or email us. 1). Cost Saving – Its cheaper for a member of staff to do the PAT testing rather than paying a contractor. 2). Convenience – It isn’t always convenient to have contractors in the workplace and they can’t always be there when it’s the best time for you. If it would be more convenient for you to run your PAT training course after your normal working day or at the weekend we would be happy to oblige. The Quick Test PAT training course is a half day course. The microPAT tester is so simple to use it doesn’t take a full day of your precious work time to learn how to use it. Our course trainers travel nationwide so whether you need PAT Training in York, Birmingham, Sheffield, Manchester or Land’s End to John o’ Groats, give us a call to arrange your PAT Training course.